Note: This is not a sponsored video. 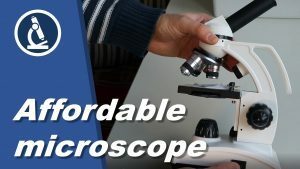 I bought the microscope myself and am not paid etc. for doing this review. – Overall good build quality. – The 10x eyepiece has a very small eye relief and therefore you have to go very close to the eyepiece to see an image. This is also a problem for the mobile phone adapter, which requires an eyepeice with a longer eye relief so that one can get a full image. This is where they saved costs: You have to cut down costs somewhere for this price. – optical quality of the 40x is noticable lower than of better microscopes. – They should have included a better 10x eyepiece instead of a second 25x eyepiece.